As your business grows, so do your daily operations. You need a system that can grow with you. The Smart Service software solution is a security company management software that takes care of all your scheduling needs. As a QuickBooks add-on, you can sync all scheduling, billing, and client information into one easily accessible database. You can easily schedule new jobs, rearrange existing appointments, and communicate all changes with your field technicians. Smart Service is the best security company scheduling software for all your needs, right now and in the future. Sorting through customer profiles, various paper records, databases, and a physical calendar for open time slots can become a huge pain for dispatchers trying to work as efficiently as possible. This is where Smart Service can help! Dispatchers have easy access to any information they need, they can even pull records quickly while on the phone with a potential client. With QuickBooks integration, you don’t have to worry about whether the schedule is up to date, or if the information on hand is the latest. 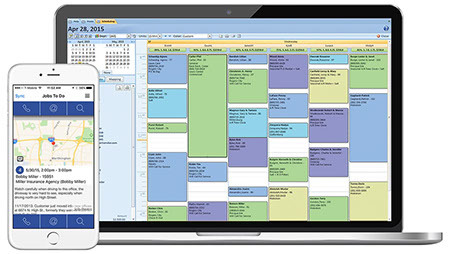 With Smart Service security company scheduling software you’ll know everything is in order. Smart Service security company scheduling software will make scheduling the easiest job to do in your office. Because Smart Service syncs with QuickBooks, your customer database is already at your fingertips. First, pull up the scheduling page and you’ll see all your active technicians, their jobs, and even future unassigned jobs you’ve created depending on your personal preference settings. You can even further organize that day’s jobs by color coding them according to specifications like their zip code. From there, click on any opening and type in the customer’s name. Our QuickBooks integrated software will pull up the matching customer and insert any information you have, including job history, inventory, and additional notes. Our interface lets you take that job and drag it to wherever it fits best. Best of all, once that job is assigned to a technician, the technician will be alerted to the change when they open our mobile app. This ensures everyone on your team stays on the same page. Now you know how easy scheduling in the office is with Smart Service, so you won’t be surprised to learn how simple it is for your field workers to maximize their job time as well. You can add new jobs with ease and those jobs then show up on the Smart Service mobile app in the hands of your technicians. They have access to all the information they would need for each individual job, including previous work, notes, and contact information. They can even send a notification to update the client on their arrival time! If for some reason you need to cancel or reschedule a job, they get that information as well and won’t waste time or gas heading out that way. This app also eliminates the need to backtrack for supplies, paperwork, and equipment. This feature improves efficiency for field work and allows for more completed jobs every day. Smart Service takes care of your daily operating system so you can take of your business. Request a free demo of our security company scheduling software and see what the change can do for you! Check out some of our advice on how to stay on top!